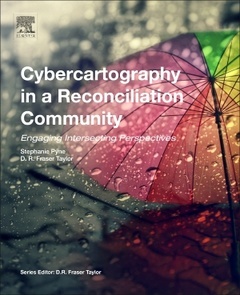 Cybercartography in a Reconciliation Community: Engaging Intersecting Perspectives, Volume Eight gathers perspectives on issues related to reconciliation-primarily in a residential school context-and the unifying power of cybercartography in identifying intersections in disparate perspectives, understanding approaches toward reconciliation and education, and enacting reflexivity in research and knowledge dissemination. The positionality aspect of reflexivity is reflected in the chapter contributions concerning various aspects of cybercartographic atlas design and development research. The book offers theoretical and practical knowledge of collaborative transdisciplinary research through its reflexive assessment of the relationships, processes and knowledge involved in cybercartographic research. Using, most specifically, the Residential Schools Land Memory Mapping Project for context, the book describes the project?s innovative collaborative approach to mapping institutional material and volunteered geographic information. Exploring cybercartography through the lens of this atlas project provides for a comprehensive understanding of both cybercartography and transdisciplinary research, while informing the reader of education and reconciliation initiatives in Canada, the U.S., the U.K. and Italy. The book will be useful to cartographers worldwide, as well as individuals engaged in inter-, multi- and trans-disciplinary research, including Canadian, American, North American and Indigenous Studies, and to those interested in the residential schools issue including residential schools survivors. The book will also be of interest to the general public to the extent that there is interest in learning about new transdisciplinary approaches to cartography, and reconciliation and education efforts in relation to residential schools as well as other areas involving institutional care.